Is It Possible to Play That Mariah Carey Song Too Much? Christmas has come and gone, and in its wake it leaves the Spotify record for most streams in a single day totally crushed. XXXTentacion’s single, ‘Sad!’ previously held the record with a whopping 10.4 million streams, that is until Christmas eve. 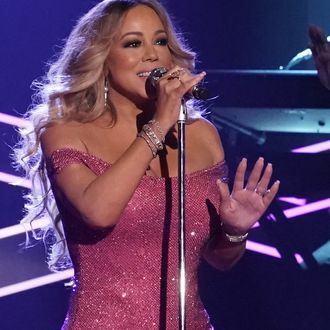 Enter the undisputed Queen of Christmas Mariah Carey whose millennial Christmas classic, ‘All I Want for Christmas Is You’, raced to the top, reaching over 10.8 million streams that day, according to Chart Data. Even Carey herself was taken aback at the now 24-year-old single’s sudden and meteoric rise to the top, tweeting out on Christmas morning to express her pure shock at a gift greater than Santa could even ever bring her: “Wait … What? !” But now the holiday is over and, for the sake of our sanity, we have to put this song away until November. No seriously, stop. Is It Possible We Play That Mariah Carey Song Too Much?